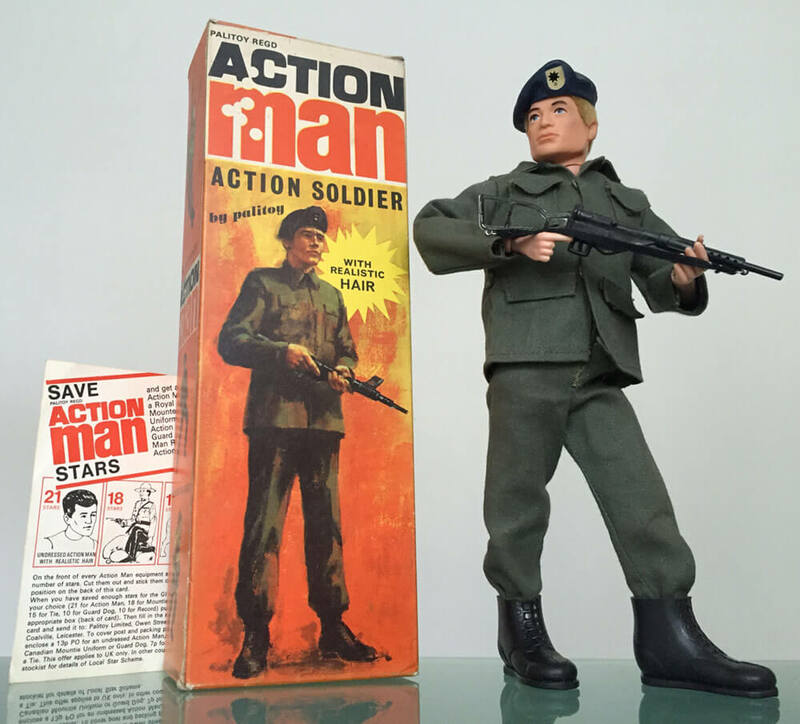 The basic Action Man Action Soldier figure from 1966, was replaced by a blonde or brown flock haired Action Man figure, with a uniform of a more British flavour in 1970. 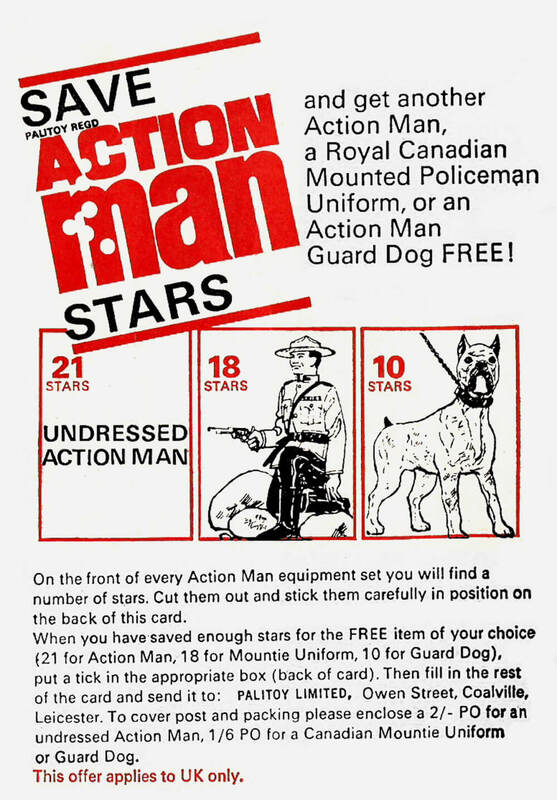 This was the first real deviation away from the US GI Joe's uniform and accessories for the basic soldier - it marked a major shift in Action Man's nationality. 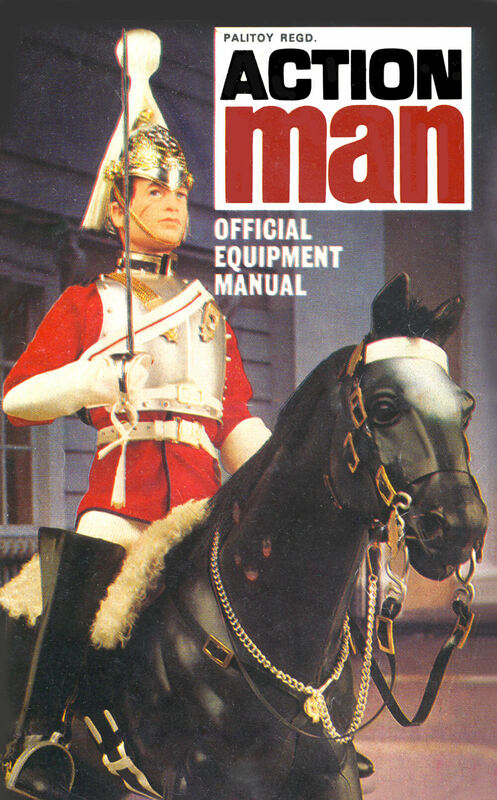 Bill Pugh (Director of Design, Research and Development at Palitoy) had seen the vast opportunities flocking could bring to products whilst watching BBC TV's 'Tomorrow's World' - where the outside of a car was rather surprisingly totally covered in flock. 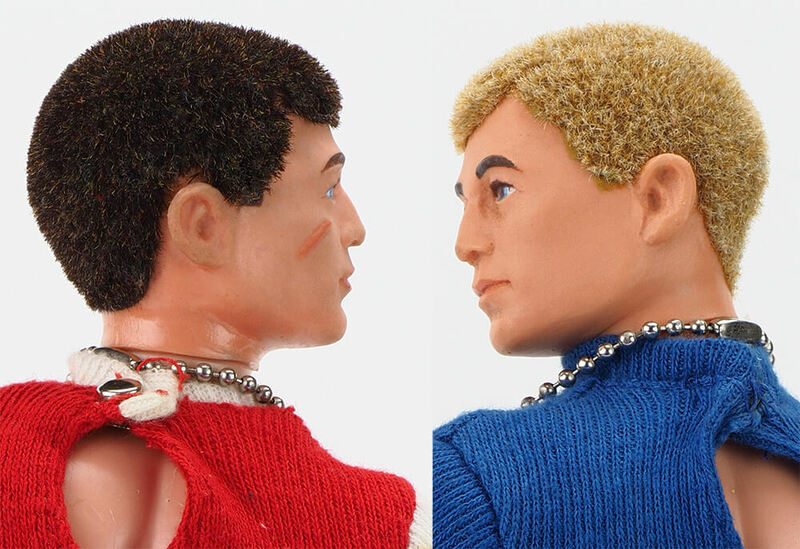 This inspired Action Man to adopt realistic looking 'fuzzy' hair in both a blond and brunette - using multi-coloured shades of fine flock strands. 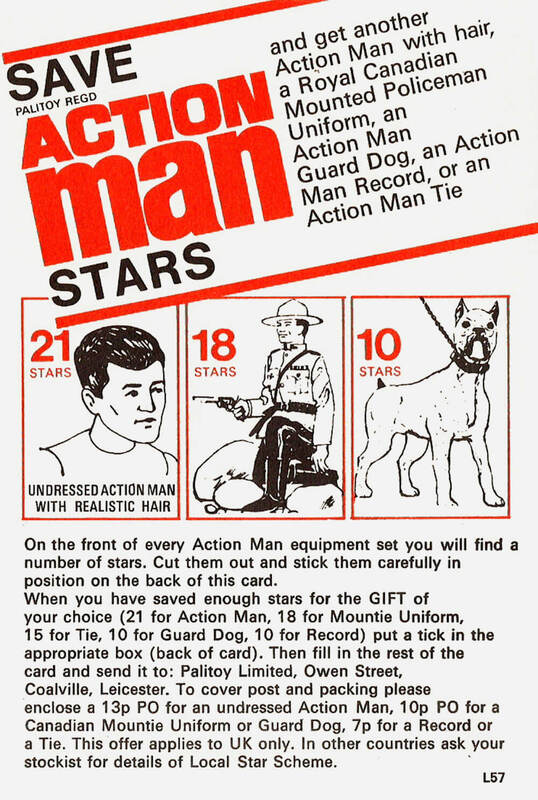 Like his predecessors, there were no clues on the packaging as to the contained figure's hair colour. Only by carefully opening the sellotaped-shut box top in the toy store would have revealed as much. 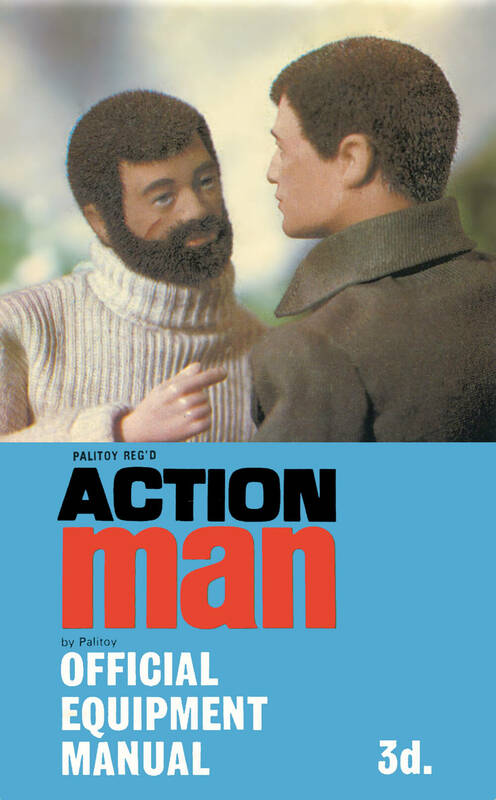 A year later in 1971 the Sailor and Adventurer got even more flock with the first of the realistic looking beards. This novel flocking process also found its way onto the sportsmen display stands, an appropriate replacement for the dark green lead-based painted 'grass'. 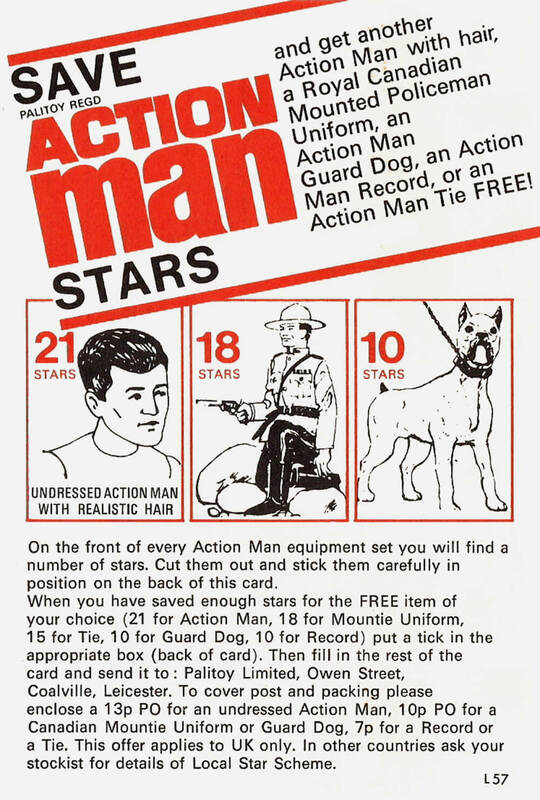 The Action Soldier could be accessorised further by equipment card sets. 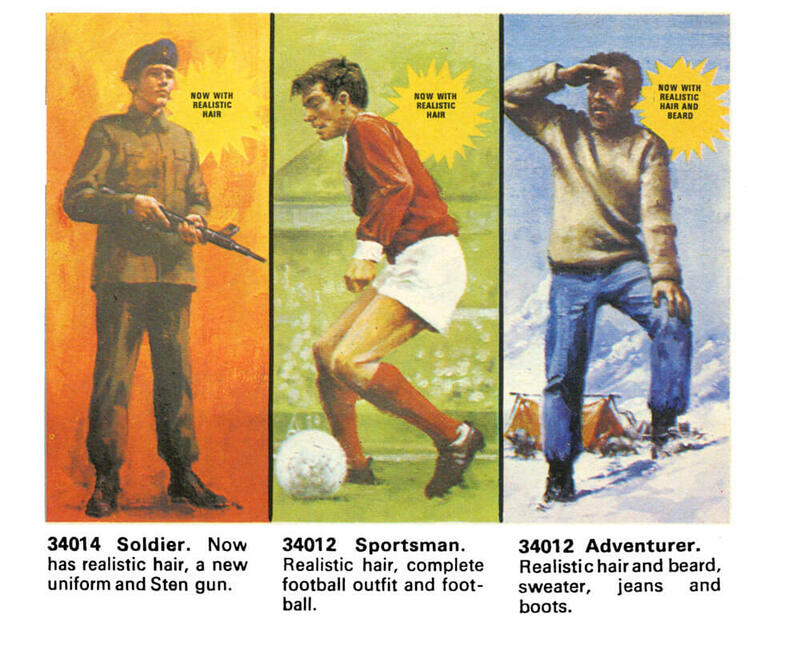 It was the last to be named "Action" Soldier as the following basic military figures from 1973 were named just 'Soldier'. 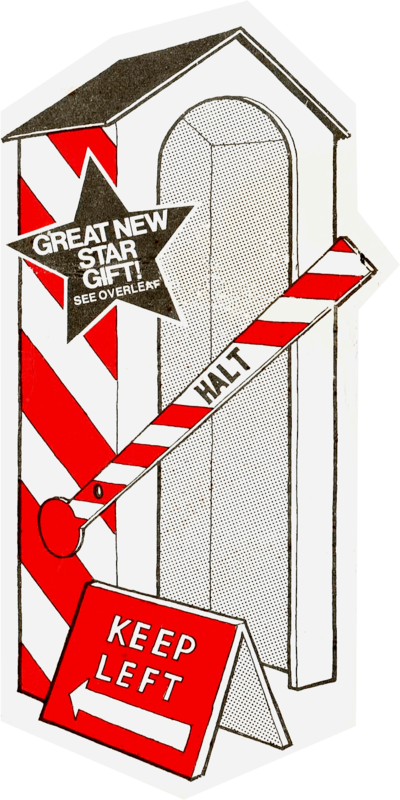 Also introduced was a new plastic dog tag with metal ball chain, replacing the former US style all-metal version. 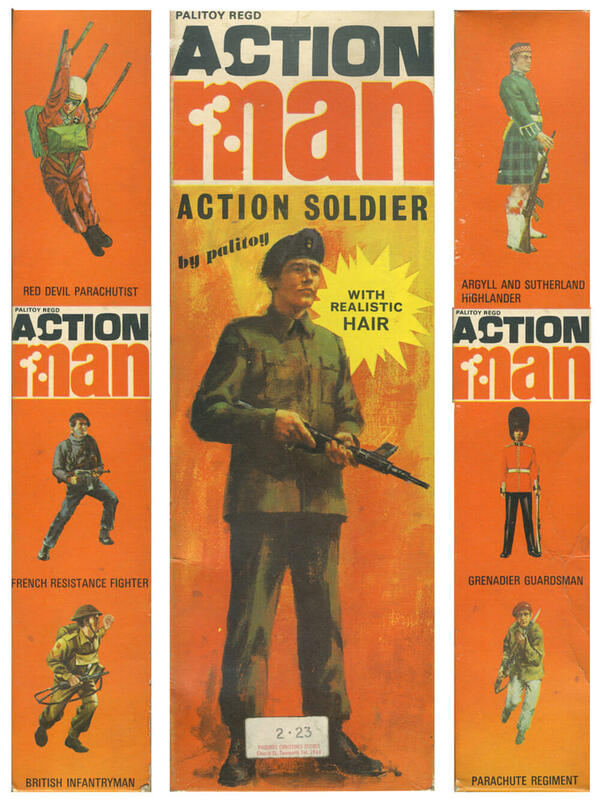 Flock haired Action Man figures were launched in 1970 along with new artwork boxes. The body remained the same offering with hard hands - painted rivets were a distant memory by this stage. 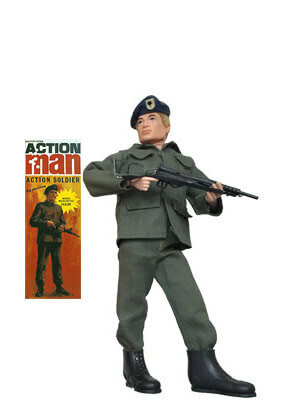 Action Man now came with a blue beret with gold and black insignia (of the type first seen on the Talking Commander which was black with red and black insignia). 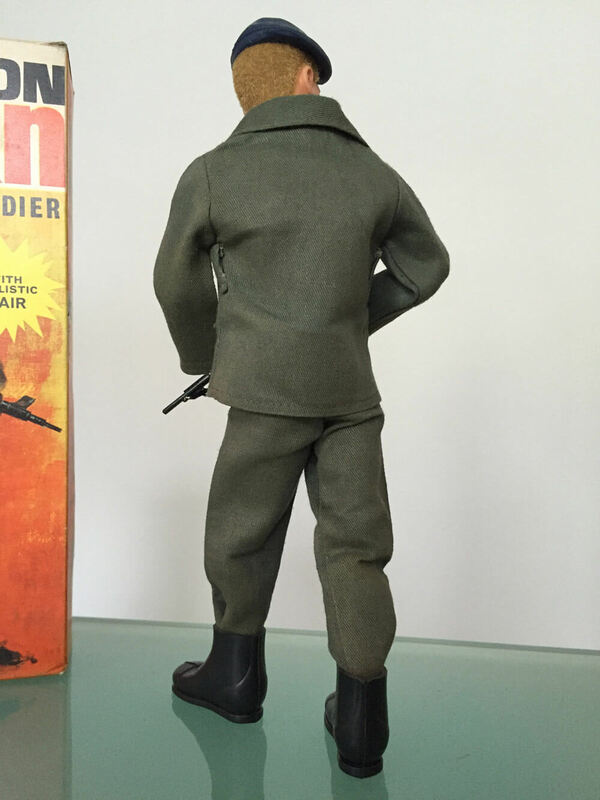 He carried a STEN sub machine gun (as per British Infantryman) and is often pictured with a belt, that he was not actually issued with, despite the fact that he has belt loops on his jacket. The box art offers no help as the midrift is obscured. 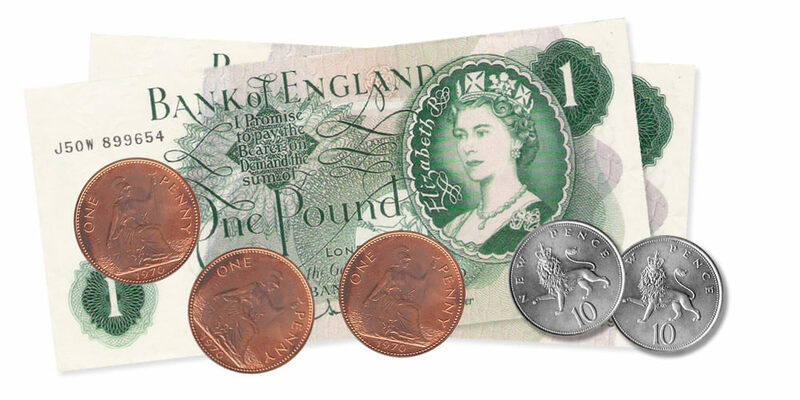 The jacket had very generous 1970's style lapels, and the suggestion of four front pockets. 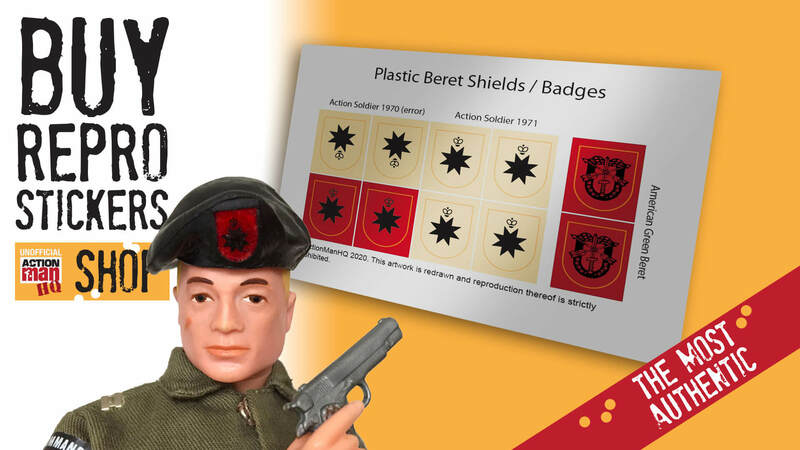 The beret's upside down badge's orientation on our figure was corrected on a subsequent release so both types exist - upside down being likely the rarest version. 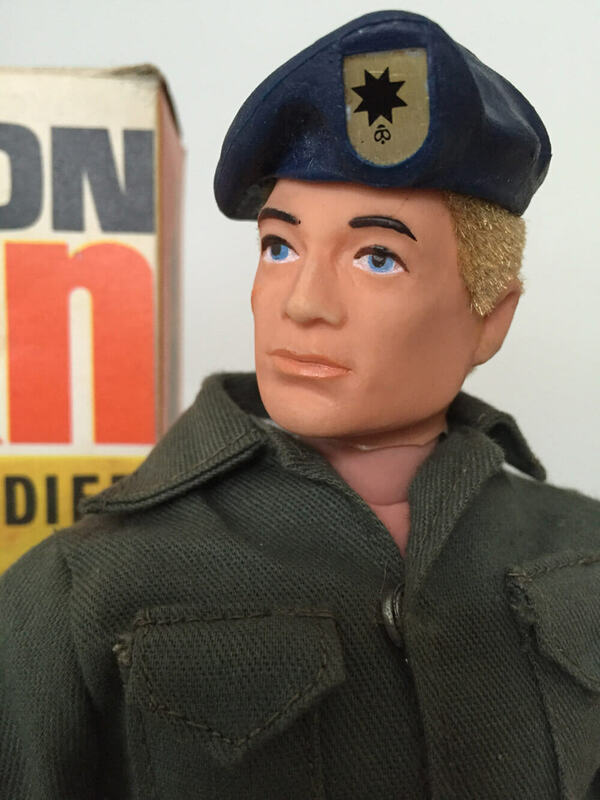 This upside down mistake is also known to be duplicated with the Talking Commander's beret of the same period despite being right in an earlier version - most strange. 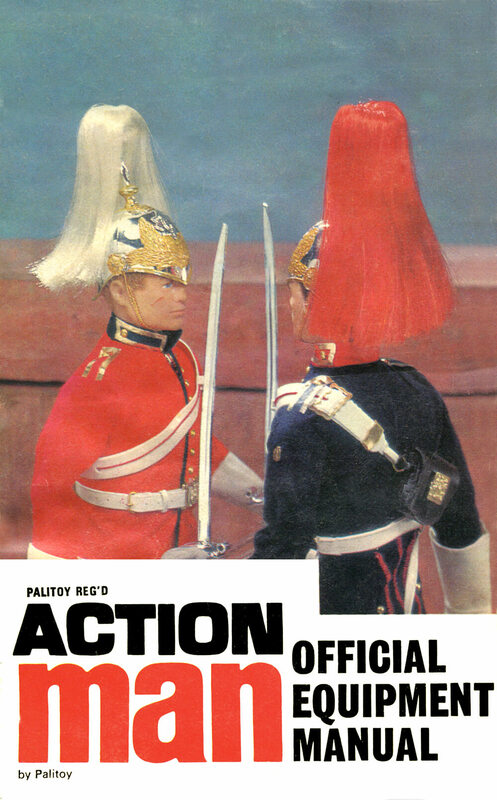 Action Man flock brown and flock blond hair colours introduced in 1970 on the softer plastic headsculpts. Berets stayed put, and helmets stopped rattling around.